Group News Blog: How Dangerous is Being a Cop in the US? How Dangerous is Being a Cop in the US? I saw a posting on Facebook (which I can no longer find, because Facebook posts are ephemeral and the algorithm used to put things on your timeline is apparently unstable) talking about the cost/person of police departments in major cities throughout the US. In the comments was the question "how much do you pay someone to risk getting shot every day?" with the implication that your average police officer in the US faces a substantial risk of death by gunfire daily, and therefore whatever the costs were, they were a good value. And that got me thinking. Always a dangerous place for me to go. How dangerous is it to be a police officer in the US? Is there significant risk of dying by gunfire? How does it compare with other occupations? How many police officers are there in the US? How is that number changing annually? According to the Bureau of Labor Statistics, there were 780,000 "Police and Detectives" in the US in 2012. That's our baseline. That number, BTW, is expected to grow by 5% by 2022, totaling about 821,000 by then. I'd love more data about this, but it's all I could find in a quick search, so we'll consider 780K as our baseline number of police in the US. How many police officers died in the line of duty in 2012? Was that number "typical" for the years around it? Frankly, I think I see a slight downward trend in the data, but the math says otherwise. 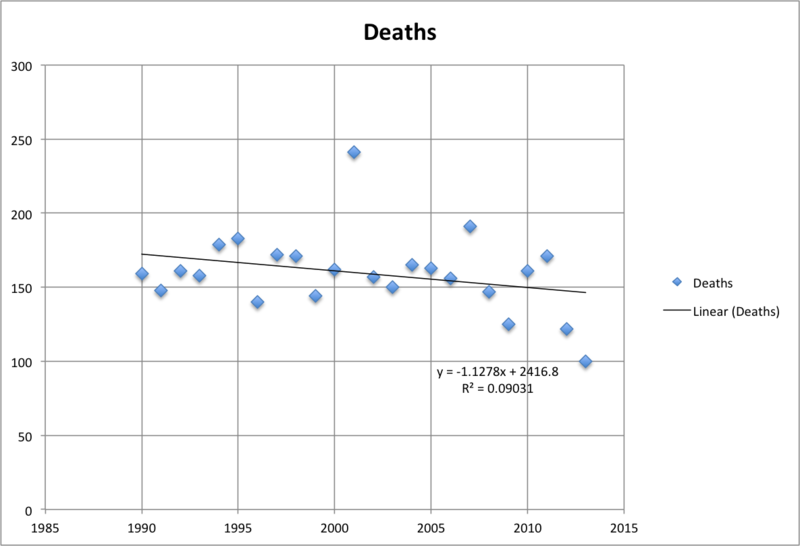 There's virtually no correlation between passage of time and number of police deaths. I note that 2001 (241) is quite an outlier. You have to go back to 1981 to get another year where more than 200 police died, but in the 70s, only 1977 (192) had fewer than 200 police deaths. The 70s were far worse than the 60s, which were worse than the 50s. What's the chance of death in the line of duty for a police officer in the US? What's the chance of death by gunfire? If there are 780,000 police officers in the US and 159.4 die annually (the mean from 1990 and 2013 inclusive), the chance of dying is 159.4 in 780,000 or 1 in 4892.8 or .0002. That's about 2 hundredths of a percent. Specifically taking 2012 numbers, it's 122 in 780,000 or 1 in 6393 or .00016, or about 16 thousandths of a percent. But let's take the higher number of 1 in about 4890, again .0002. Expressed as a death rate per 100,000, that is 20.4 -- that is, 20.4 of every 100,000 police officers in the US die annually from line-of-duty causes. The overall annual death rate in the US for 2010 (the most recent final value I can find according to the Department of Health and Human Services, at the CDC website) was 747.0, with a preliminary value of 740.6 for 2011. So police line-of-duty death rates are about 3% of total mean death rates. Police line-of-duty deaths, while tragic, are not a significant risk compared to mean death rates in the US. But wait, we want to talk about gun-related police deaths, right? Again according to the National Law Enforcement Officers Memorial Fund, in 2012 50/122 officers killed died from gunfire. Over the past decade, the mean percentage of officer deaths from gunfire was 36%. So the gun-related death rate is 20.4*.36 = 7.4 per 100,000. How do these death rates compare with other ages, causes, and professions? In 2008 (the most recent year for which data in a complete Statistical Abstract of the United States is available), the only age range to have a death rate anywhere near that low is 5-14, where the male death rate was 24 and the female death rate was 12. Police officer line-of-duty deaths are therefore less common (statistically) than any death of 5-14 year old boys, although more common than 5-14 year old girls. Line-of-duty gun deaths are about one-third as common as all deaths of 5-14 year old boys and about half as common as all deaths of 5-14 year old girls. In 2008, the mean death rate for males 25-35 (in which age range I imagine many police officers fall) was 225. For males 35-44 it was 348. So depending upon their age range, police officers are between 10x and 17x more likely to die from non-work-related causes than line-of-duty causes. And 30x to 47x more likely to die from non-work-related causes than line-of-duty gunfire. In 2006, comparable causes of death to all line-of-duty deaths include: Heart Failure (excluding ischemic heart disease aka "a heart attack") at 20.2; NonTransport Accidents (including falls, drowning, smoke inhalation, fire/flames, and poisoning) at 24.4; Diabetes at 24.2; Alzheimer's disease at 24.2; Drug and Alcohol induced deaths (combined) at 20.2. Also in 2006, comparable causes of death to gun-related line-of-duty deaths include: prostate cancer at 9.5; Leukemia at 7.3; Falls at 7.0; Alcohol induced deaths at 7.4. According to preliminary data for 2013 (see page 14), the rate of "fatal occupational injuries" in Construction is 9.4 per 100,000; Transportation and Warehousing is 13.1; Agriculture, forestry, fishing, and hunting is 22.2; Mining, quarrying, and oil and gas extraction is 12.3. In other words, it's as dangerous to be a police officer as it is to be a farmer (3 million people), forester or logger (1.7 million people), commercial fisherman (1 million people) or hunter (about 14,000 people). So there are over 5.7 million jobs in the US more dangerous than being a police officer. And another 6 million in construction, which has a higher death rate than police gun-related deaths. So yeah, being a police officer is a dangerous job, but the job-related danger is much less than your basic life-related danger (health problems, general accidents, etc.). And there are about 7 times more people doing Ag-related jobs which are more dangerous than being a police officer. So what do we have to pay these people to risk being shot every day? I'd say a mean of about $57K per year, which is what they get. Maybe we need to raise the pay of the people in Agriculture, forestry, fishing, and hunting, who get mean annual wages in the $18K - $41K range for more dangerous jobs. I realize that putting the TL;DR way down here kind of defeats the purpose, but it allows me to put the conclusion after the work, which I like. Being a police officer is a dangerous occupation. But there are plenty of people in the US who do more dangerous jobs for far less pay. Police line of duty death rates are comparable to death rates from Diabetes and Alzheimer's disease or the combination of drug and alcohol induced deaths. Police line of duty shooting death rates are comparable to alcohol induced deaths, Leukemia, or death by falling. A male police officer between 25 and 44 is many times (10x - 17x) more likely to die from a non-work-related cause than to die in the line of duty. And only about one-third of those line-of-duty deaths are gun-related. On average a police officer dies in the line of duty in the US about every 55 hours (everything you need for this calculation is above so I'm not going to insult your intelligence by including it). On average a police officer kills a civilian (about 400 annually) about every 22 hours. So I think we have more to worry about from them than they do from us. Not to mention the daily abuse that Police Officers fave by the public. They spend 8-12 hours a day (depending on shift length) dealing with people that are nasty, verbally and physically abusive, violent, spit at you, scream and try to fight you, etc. I don't think other careers in agriculture and such deal with those things on a daily basis day in and day out. Comparing murder to natural causes or just death rates in general is like comparing apples and oranges, they are both fruit but not very similar. You put so much work into incomparable statistics.